ePublishing Knowledge BaseePublishing Knowledge BaseePublishing Knowledge Base Creating Image Galleries, Videos, Podcasts, and Downloadable FilesHow do I add videos from YouTube or files from corporate servers to be easily used on my website? The ePublishing Media Manager allows you to host or connect with your files YouTube.com or corporate Digital Asset Management systems. For example, YouTube and Vimeo videos can be uploaded as remote files and your system will automatically use those video players when you associate the videos with an article. If you have a video player from a different video solution, such as BrightCove, talk with your Solutions Manager. 1. Within the Media Manager, click New File in the top right of the window. 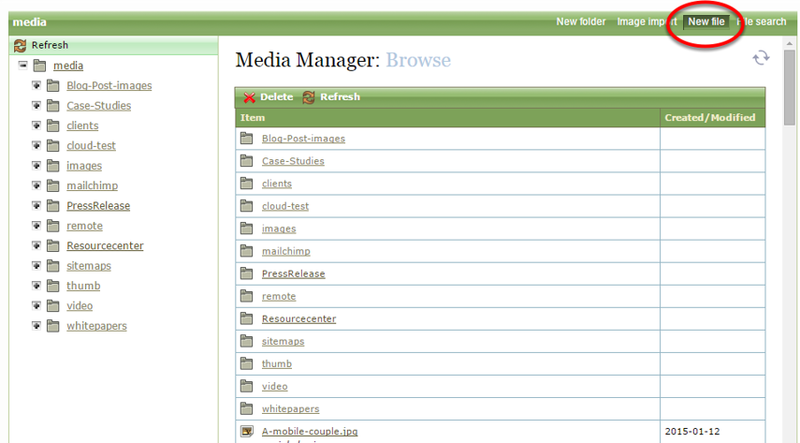 Zoom: Within the Media Manager, click New File in the top right of the window. 2. When you click New File, a window will appear. You may upload a file directly to the Media Manager or reference an external file. This article covers the latter. Learn more about uploading media directly in the article: How do I upload new media, such as photos, videos and files? 2.1. 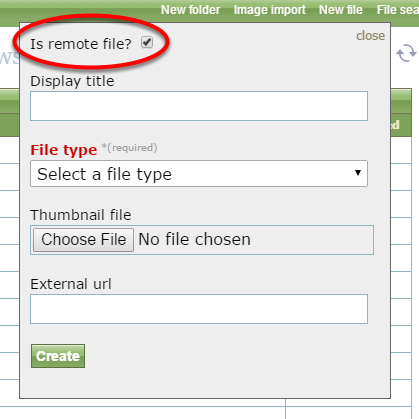 To associate an external link, click the box next to Is remote file? 2.2. You may use this feature to associate videos hosted on YouTube or Vimeo. Select your file type, and paste the URL path of the file you wish to link to. Remote files may only be video, audio or general files, such as a PDF, but not images. 2.3. Click Create, and edit like you would a typical image or file in your Media Manager. 2.4. A thumbnail image is not required. 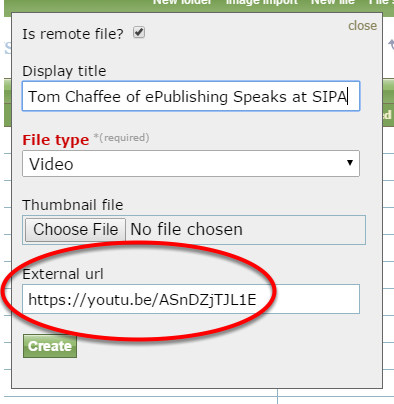 For video files, ePublishing will pull a thumbnail automatically from YouTube when the reader's page loads. If you are using any other third-party video host (other than YouTube), you will need to add a thumbnail. 2.5. When you are finished editing your file's attributes, click Save. Prev: How do I find remote files I added from YouTube, corporate digital asset management servers and other locations? Next: How do I change the thumbnails for photos, videos and files in the Media Manager?